The App for the iPhone displays some characteristics of the Clocks, but does so in a way that illustrates another perspective on Schrödinger’s cat, and represents the principle of the Observer Phenomenon in quantum mechanics. Once the app is running (select Start from the front page of the App), the passing of time is noted by the same ‘tick-tock’ sound in the Clocks. If you look at the iPhone when the app is running, but not from directly in front, the camera will not observe you. This is the representation of an event that is not observed, so the state of the event is effectively unknown. In the original illustration, Schrödinger’s cat is either alive or dead (or both). In Schrödinger’s Clock®, this uncertainty of state is represented by the Clock randomly showing either the right time (‘Now’) or the Wrong time. If, however, you then choose to Observe the event, in other words you turn the iPhone to face you (at a loose arm’s length), the iPhone recognises that it is being Observed and the display changes to show your face (the Observer) as well as changing (usefully) to show the right time (‘Now’). This is like opening Schrödinger’s box and finding the cat alive and looking at you. If you are Observing the Clock in low light conditions, you can select the ‘Night’ option at the bottom of the screen. In low light conditions, it is sometimes difficult to be confident in recognising somebody. The App recognises this in a very light-hearted way: if it detects the face of an Observer, it does not attempt to show that face, since it knows that low light levels makes this task uncertain. Instead, it admits there is uncertainty about this task, and uses a quote from Alexandre Dumas’ book The Three Musketeers: "All Cats are alike Gray in the Dark” to make this point. Uncertainty is an inevitability in quantum mechanics. The unique nature of Schrödinger’s Clock® makes it an ideal exhibit in a Museum. Bury StEdmunds, in Suffolk (England), is the location of Moyses Hall Museum which houses the Gershom Parkington world-class collection of time-pieces. The Museum is now home to Schrödinger’s Clock®. The regular tick-tock sound indicates the passing of each second of time thus letting the observer know that the clock’s displayed time is changing each second (even if they cannot see this). The form of Schrödinger’s Clock® draws on the horological heritage of the marine chronometer which is the closest analogy to Schrödinger’s illustration involving the cat in the box. A traditional marine chronometer is housed in a high-quality, polished, wooden case to protect it and the gimbal support mechanism. Similarly, Schrödinger’s Clock® is presented in a polished wooden case. 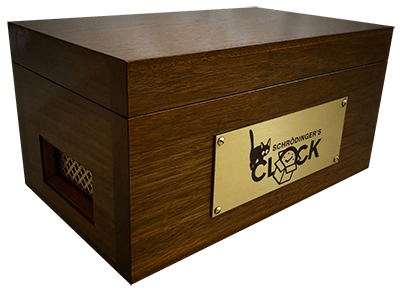 When the lid is closed, Schrödinger’s Clock® is not dissimilar to a marine chronometer as it emits a regular ticking sound to record the passing of time. Unlike a marine chronometer, however, the ticking indicates that the Clock inside the box is changing its displayed time every second in the random time mode. From the outside, the Observer cannot tell what time is displayed by the Clock inside the box. When the lid is opened, the time being displayed at that moment is frozen for five seconds before the Clock reverts to showing the current local time (NOW) in Bury St Edmunds. There is also a push button to fool Schrödinger’s Clock® into thinking that the lid is closed so that the random time generation operation can be observed (unlike Schrödinger’s Cat which cannot be observed when the box lid is closed). SCHRÖDINGER'S CLOCK is the Registered Trade Mark of Grounded Innovation Ltd., and publication number GB2557408 is the Patent Pending.